Mike Eruzione served as the enthusiastic captain that led the 1980 United States Olympic hockey team to its gold medal victory. He scored the winning goal against the Russians in the second-to-last game—the goal and game that stunned the world. A native of Massachusetts, Eruzione was well-known as a local sports talent, playing on all-scholastic teams in baseball, football and hockey. At Boston University, he captained the hockey team his senior year and finished as the second-leading scorer in B.U. history. During the four years that Mike played at B.U., his team won Eastern Collegiate Championships. He was cited as best defensive forward in the East all four years and later was inducted into the B.U. Athletic Hall of Fame. He was a member of the United States National Team in 1976. After graduation, he played for two years with the Toledo Gold Diggers of the International Hockey League, maintaining his amateur status. There, he was voted the McKenzie Award Winner. The award is presented annually to the most outstanding American-born hockey player in the League. The following season, Eruzione was chosen to join the U.S. Olympic Team as the left wing. He was elected captain by his teammates. For several years after the 1980 Olympics, he spent time in New York and New Jersey as a commentator for the Madison Square Garden Communications Network. He provided coverage of the New York Rangers’ and New Jersey Devils’ games and also did special interviews with players and coaches. He was presented the Shaeffer Pen Award by the New England Hockey Writers in 1981 for his outstanding contribution to hockey. In preparation for the 1984 Olympics, Eruzione worked in conjunction with Anheuser-Busch, raising funds for the Olympic Games through the Olympic Art Work Project. In 1984 and 1988, he broadcast both the Winter and the Summer Olympic Games from Sarajevo, Los Angeles, and Calgary for ABC Sports. Presently, he divides his time between charity work, public speaking engagements, and serving as director of Development for Boston University Athletics, a post to which he was named in September 1995. Prior to that, he worked as B.U.’s director of Special Programs for Alumni Relations and Development for two years. He also serves as an aide to Jack Parker, head coach of B.U.’s hockey team. Do you want to hire Mike Eruzione? Directly request a quote. In 48 hours we can send you the availability of Mike Eruzione If you would like to book Mike Eruzione, Entertainment Booking Agency is the right place. 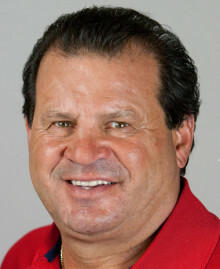 We will offer you the best price and contact the management or we directly contact Mike Eruzione. For corporate appearances or speaking engagements you can contact our agents and the will help you true the process. Tags: hire Mike Eruzione, Mike Eruzione booking, book Mike Eruzione, Mike Eruzione appearances, find more information on booking Mike Eruzione for appearances, Mike Eruzione speaking engagements, Mike Eruzione endorsements/spokesperson, Mike Eruzione appearance fees, Mike Eruzione booking agency contact info, biography of Mike Eruzione, Contact an artist booking talent agent find a speakers bureau that can book Mike Eruzione, speaker booking agency for Mike Eruzione, Mike Eruzione booking agency, Mike Eruzione booking for corporate event. EBA is one of the biggest entertainment booking agencies in the World. We book hundreds of celebrities, artist, athletes and speakers in a year. Important to know is that we are not claiming to be the management of Mike Eruzione. We are not the official agent for Mike Eruzione. Companies from around the globe book these artists and speakers true our company be course we have one of the biggest networks and we always have direct contact with the artist or the management. We help you to find the right celebrities for your corporate of private events. Please contact one of our agents to get free advice and we will help to get the world-famous artist on your party.